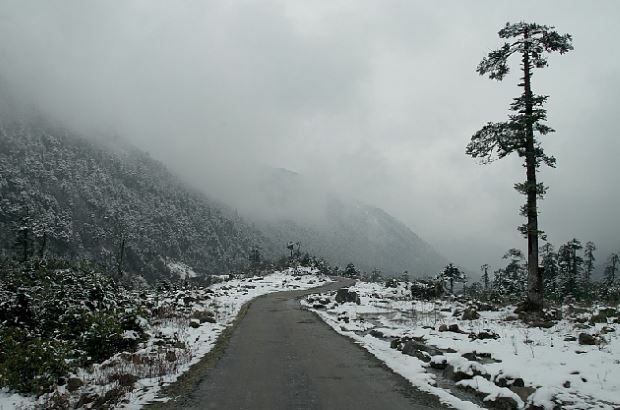 North Sikkim is one of the four districts of Sikkim state. As this falls under Restricted and Protected areas, all tourists ( Indian & foreigners ) need permission to enter these areas. Foreigners are not allowed to travel beyond Yumthang valley and in other side they are not allowed to enter Guru Dongmar Lake area. Permissions can be arranged by your travel agencies or tour guide. You need to submit two photos of all adult members and copy of identity proof. Usually tourists leave Gangtok before 10 AM after the permit is ready ( by travel agent ). After traveling 7 KM from Gangtok there is Tashi view point. If the weather is clear then you can get a good view of peaks of Kanchenjunga, Gangtok and valleys around it. The first checkpost is at a distance of 25 KM on the way is Kabi outpost where the permit is to be shown. At a distance of 30KM ( One and half hour journey ) from Gangtok this is the first major water fall on the way to Chungthang. There is a nice view point with steps to go near the water. There is a restaurant here of tourism department offering coffee tea and snacks. You can spend 15 minutes here. 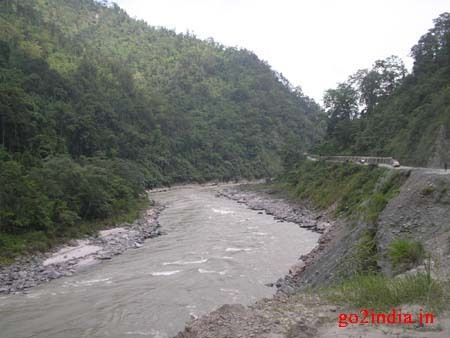 On the way you will pass through Phodong 40 KM from Gangtok. Time to take your lunch here. If you don't want to take lunch here then you can get at Namok at a distance of 10 KM ( 20 minutes drive ) from Phodung and 50 KM from Gangtok. Mangan is at a distance of 66 KM from Gangtok. This is the district headquarter of north Sikkim district. Here you can get fuel for your vehicles. This fuel station is open from 6 AM to 8 PM. There is a check post at the end of this town. Your permit is to be shown here. At a distance of 85 KM this is the best water fall on the way to Chungthang. You will take five hours to reach this point from Gangtok. Toong Police check post is just after 3 KM from Naga water fall. Areas here are comes under Restricted and Protected areas. After the check post over the Tung bridge we will cross Tista river and after this the river will be at your left side. At a distance of 99 KM this is a small town and one hydroelectric project is under construction here. While descending from the hill you will get the view of this small town. You can break here for a cup of tea as you will be here around 4 PM. Buy all your required items from here as you may not get them in further north. Just after this town there are two roads ( Y junction ) one goes to Lachen ( left side or in west direction ) and other one goes to Lachuang ( right side or in east direction ) . From Chungthang Lachen is 30 KM and it will take one hour 15 minutes to reach the small town of Lachen. From Chungthang Lachung is 22 KM , it will take 45 minutes to one hour to reach Lachung. Note that the packages offered for North Sikkim are inclusive of food, accommodation and transport. So you need not pay for your food or bottled drinking water. BSNL mobile signal is only available in major towns and villages of North Sikkim. Roads to north Sikkim is open through out the year. However there is a chance of road blocks due to landslides mostly during rainy season and after that for a month. We require a package for 2 nights & 3 days at yamthung, luchang and gurumodar lake. DAY 03: LACHUNG - YUMTHANG EXCURSION - GANGTOK.